Iridium 9602 Modem is a robust data terminal specifically designed to incorporate the Iridium 9602 SBD module with an inbuilt 6.5-32V DC power supply as well as RS232 data connectivity into a robust enclosure ready for use in a wide variety of applications accessing the Iridium Short Burst Data. 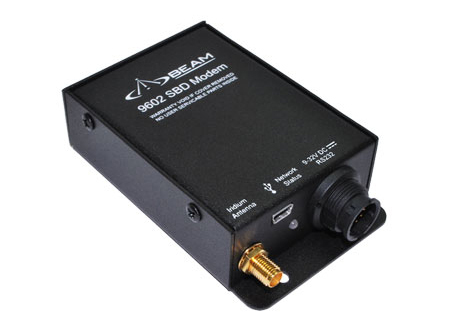 Beam 9602SBD Data Modem is a robust data terminal specifically designed to incorporate the Iridium 9602 SBD module with an inbuilt 9-32V DC power supply. It is currently the smallest SBD Modem product on the market. The terminal connector supports power input, USB & serial data to be used on the modem. The robust enclosure enables the terminal to be used in a wide range of applications.